Check out this video on sprinting posture drills for a preview of what we will be working on today. Hells yeah! Francis’ weeks of practice pays off with his first muscle up! Then follows it up with another 18 in the WOD! We can go through a variety of emotions on any given day in a CrossFit session. Depending on the workout of the day, we may feel nervous, excited, curious or nauseous. Many of the uninitiated are intimidated by what we do, yet when they get into the program people become addicted to the workouts. 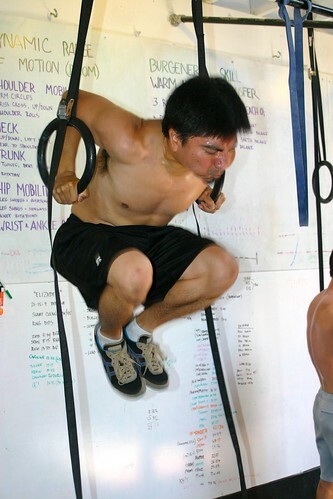 There is an inherent aspect of CrossFit that helps to foster this type of environment. It is the competition. It is in our nature to run faster when we are chasing someone or if someone is chasing us…which only leaves us the option to run faster! We recognize that an increase in intensity will get you fitter faster, so we use the small group competitive environment as a tool to achieve that goal. Those with a background steeped in competition are stoked to get the challenge back into their lives, while others are just learning the thrill of victory and the sting of defeat. “The Central Coast Clash” is an individual competition that will take place on Saturday, August 14th, from 9am to ??? The day will include 2 WODs (TBA on Thursday, August 12th) with scaled options so that all athletes can participate, and will conclude with a tasty potluck and free beer! The deadline to register for this event is Sunday, August 8th, and the cost is $20 per athlete with friends and family are welcome to observe. Athletes can CLICK HERE to register or visit their website at www.crossfitventura.com. The Next Level Invitational Date is August 14th as well. This is a one day, three event competition with three divisions: advanced/ intermediate / masters (45+ yrs old). There will also be an Affiliate Champion comprised of the individual competitor’s placings, taking the scores of your top 2 male and female per division. Registration will open on July 1st at 12pm and close on July 16th or when we reach 250 competitors. CrossFit 714 is hosting “Clash of the Affiliates” on September 11th in the same format as the Regional competition. Six members per team, four competing at a time in 3 events. Registration opens July 1st with a cost of $200 per team.